LG Optimus G2 to crash through the full HD 5-inch smartphone barrier? 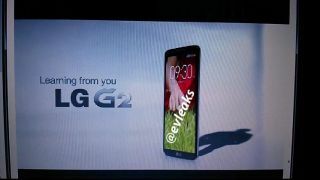 The forthcoming launch of the LG Optimus G2 may be a little more newsworthy than previously expected judging by recent rumours and speculation. Last week we heard the device may feature volume buttons on the back and today reports claimed the new Optimus will be the first smartphone from the company to boast a full HD screen larger than 5-inches. Up until now, speculation had suggested the device would be rocking a 5-inch 1080p screen, but TechBlog brings word that the Korean company plans to stretch it out another two-tenths of an inch. Other new information from the TechBlog report claims the device will also have a 13-megapixel camera, bringing it in line with most of the other top-line handsets on the market. Previous leaks have shown an edge-to-edge display, while its highly likely the device will arrive packing Android 4.2 Jelly Bean. LG has already said the device will pack the Qualcomm 800 series processor, while the company is also thought to be working on a phone with always-on voice commands. In terms of a release date? Well we should hear more about LG's August 7 press event in New York where the Optimus G2 is likely to be unveiled.